TDI | Mainline Conveyor Systems, Inc. 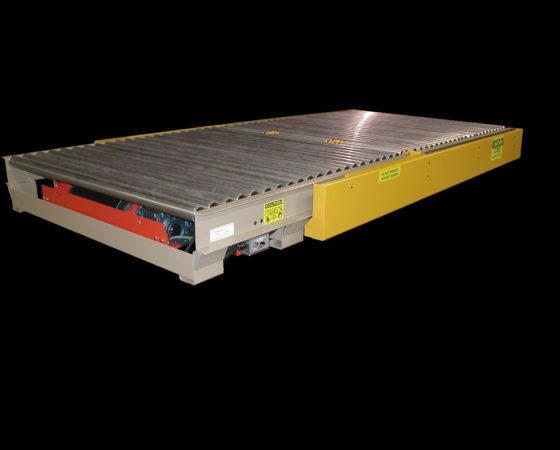 The Infeed Transfer Device is primarily a pusher bar that spans the width of the conveyor and moves along a path to push loads off the end, onto an adjacent perpendicular conveyor. The pusher bar or Head is recessed in the roller surface, at it’s home position, allowing loads to pass over while moving to the conveyor end. Once clear of the head, the head raises above the surface of the rollers and moves to push the load off the end of the conveyor. The pusher head is comprised of structural members that provide rigidity yet allow the head to fit recessed between the drive belt and the top of the rollers. The head is supported beyond the conveyor’s sideframes by a pair of side arms. These arms are supported and guided by guide rails mounted to the sideframes of the conveyor. The pusher assembly is pulled, by a common drive, by means of tow chains attached to each side arm. The pusher head moves from it’s recessed position, up, to engage the load, pushes the load completely off the end of the conveyor, and returns home and waits for the next load. Adjustable limit switches control the home and full forward positions of the stroke.